July 23, 2009 - Anchorage Mayor Dan Sullivan's 2009 Transition Team Report [Utilities Section] Candid treatment of ML&P and other Southern Railbelt electric utilities. Not new generation but all parts of the customer value chain, especially distribution covered. The poor economic value received by electric customers is specifically identified. 5/5/11 - Conflict of Interest - Union Friendly Chugach Electric Candidates (Alex Gimarc) The IBEW wants favorable treatment when their contracts come up for renewal. 4/28/11 - The forces behind candidates matter (Alex Gimarc) About IBEW Union front group "Chugach Reliability"
DIRECTOR VOTING SCORE Who are the Consumer Champions and who are the Sellouts? Save money without freezing in the dark! Reiser, Robbins, Crawford, Henderson are the official IBEW Union Candidates! with IBEW on both sides of the bargaining table. BOARD STATUS: Out of seven seats, there are NO clearly pro-consumer directors. Chugach Consumers recommends maximizing your voting power. Vote for only one director, Harold HOLLIS. PRESS HERE to vote electronically! Mitchell Roth is running again on a green power platform (see the Chugach Green Energy website). He deceptively claims, "Lower electric rates through renewable energy". The reality is his agenda will cause your electric bill to go up-up-up. Perennial candidate for everything (School Board, Assembly, Chugach) Ron Stafford can't be taken seriously. He obviously loves seeing his name in print. Board Chair, Bettina Chastain continues as a director in violation of the Chugach Electric bylaws residency requirements. We fault her for, among other things, allowing the board to put the self-serving Board Qualifications and Director Compensation bylaws on the 2019 ballot (see BYLAWS ANALYSIS below). Board Qualifications - The background for this is that two directors, Bettina Chastain and Sisi Cooper, were found last year to be living in the ML&P, not Chugach Electric, service territory, thus they were on the board without authority. Sisi Cooper resigned but Board chair Chastain was able to evade the requirements by claiming she was actually living in a Girdwood cabin instead of her obvious home overlooking Westchester Lagoon. We recommend voting against the Board Qualifications bylaw change because if current language is being ignored, why will new language help? And there is better, tighter language that could have been used, but wasn't. Director Compensation – This is just another way to increase director travel junketing and pay with no benefit to the ratepayers. It's been long-known that paid travel for co-op directors is considered to be a "perk" for serving on these boards. The Board claims, "If all members of the board were to participate in the training, the average monthly residential customer bill would increase by approximately 2.7 cents." 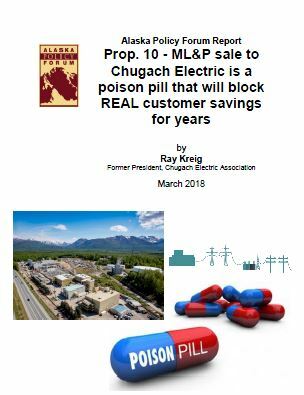 This is just another grossly deceptive Chugach Electric statement. First triple it because consumers will additionally pay any increased electric costs paid by the MOA passed through in higher property taxes and in increased prices in stores to pay the higher electric costs hit by businesses. Furthermore, the airfares, hotel, lodging costs and fees for the "training" are easily as much or more than the director pay collected on the trip. Try $2/year as a more accurate cost you will pay for more director travel excursions. They want 20 days within a calendar year for attending conferences and educational seminars...it's a ridiculous and brazen ask! The reality is that Chugach Electric and all the Railbelt utilities should be considered to be in crisis. 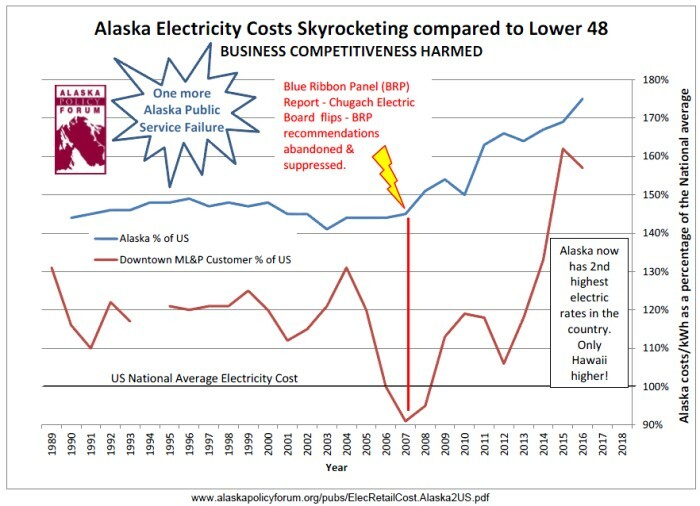 Alaska electricity costs to consumers have soared and now are the second highest in the nation, just behind Hawaii! If these directors were actually getting top-flight training on electric utility performance measures and how to competently hire, give direction to utility CEO's, and demand results, we wouldn't be in this situation. But the training doesn't do that... What they are getting is softball, non-challenging training and it's just an excuse for more travel junketing. We strongly recommend a NO vote! Right after these results were announced, normally board officers are elected by the board in a special meeting. But this time they adjourned without taking up that agenda item (probably because of uncertainties over the status of Directors Chastain and Cooper because they live in the ML&P service territory in likely violation of the Chugach bylaws. BOARD STATUS: Out of seven seats, before this election, it had NO pro-consumer directors. Chugach Consumers recommends maximizing your voting power. Vote for only one director, Harold HOLLIS. Jim Henderson, incumbent is teaming up with Mitchell Roth on a green power platform (see their Chugach Green Energy website). Rachel Morse, incumbent has a Facebook page and is also heavy into the green energy sound bites. Interestingly, he applied for the board vacancy left by Janet Reiser on the Chugach board but lost to Rachel Morse on a 6-1 vote with Board Chair Chastain voting no because she wanted Harold Hollis [12/26/17]. IBEW Union is so confident of its absolute control of Chugach Electric, it is not even bothering to make any endorsements in this election Meet Our Candidates! 4/23/18 – Alaska Politics and Elections - The Chugach Board Chair May Be Serving Illegally by Alex Gimarc, former Chugach Electric board secretary. should be guided by its board and state regulation. Mayor Berkowitz and Chugach Electric keep MOA voters and Chugach members in the DARK. Appallingly little information available for this enormous deal. Missed opportunity for clean, low cost power? ...this entire event is a failure of leadership, not from the CEA staff, but by the Chugach Electric Board of Directors. The IBEW [Union] exclusively populated the Board with their candidates since 2011. They all think alike. They all are fully compliant. And every single one of them hung the Chugach staff out to dry. 4/21/17 - Craig Medred - The NIMBY state - Before scientists in Alaska ever got a chance to study what might have been the strangest of all hydroelectric projects – one that could benefit salmon – it died in the face of public outrage. Only weeks passed between the time the Chugach Electric Association first announced it was looking into the idea of a dam on the Kenai Peninsula’s Snow River, and the cooperative’s announcement it was abandoning that idea. Chugach Consumers 2017 recommendations are the same as last year! BOARD STATUS: Out of seven seats, before this election, it had NO pro-consumer directors. Three candidates are running for two seats. Chugach Consumers recommends maximizing your voting power. Protest vote for only one director, Ron STAFFORD, the only candidate not endorsed by the IBEW-Union front group. Chugach Consumers 2016 recommendations are the same as last year! BOARD STATUS: Out of seven seats, before this election, it had NO pro-consumer directors. Four candidates are running for three seats. Chugach Consumers recommends maximizing your voting power. Protest vote for only one director, Ron STAFFORD, the only candidate not endorsed by the IBEW-Union front group. Voting for one candidate only gives your vote extra weight by denying the other two votes to the IBEW Union. Irrespective of the results of this or near term future elections, the IBEW Union will continue to have absolute control of the Chugach Electric board. FOUR candidates are running for THREE seats on the board. Legislative roundtable looks at options for reducing Railbelt power costs - Sean Doogan | Alaska Dispatch News - September 6, 2014 - Two lawmakers think the transco/ISO idea might not go far enough. Reps. Charisse Millett and Craig Johnson, both Anchorage Republicans, have another option: combine all Railbelt utilities into one company.